#Russian opposition leader Alexey #Navalny said he’s been issued with a passport that would allow him to seek treatment abroad for eye damage suffered when an assailant threw a chemical in his face. The Federal Migration Service notified him that he can collect the passport after a five-year struggle to obtain one, Navalny said Thursday in a statement on his website. He was barred from leaving Russia in 2012 over embezzlement charges for which he was later convicted and given a suspended five-year prison sentence. There appears to be a “truce for medical matters” that will enable him to travel to a specialist eye clinic, said Navalny, an outspoken critic of President Vladimir Putin who’s seeking to replace him in 2018 elections. Navalny said his right eye has only 15 percent vision after he suffered a chemical burn when a man threw green antiseptic liquid in his face in Moscow last week. Police haven’t detained the attacker even after supporters of the anti-corruption campaigner said they’d identified him from video footage of the incident broadcast on a Kremlin-friendly TV channel. Navalny’s allies say the alleged assailant belongs to a radical pro-Putin group that emerged in 2014 amid Russian-backed unrest in eastern Ukraine. A Russian appeals court on Wednesday upheld a February embezzlement conviction against Navalny in a re-trial of the original 2013 case, a ruling that could create a new obstacle for his ambitions to contest the presidential elections. Navalny announced that he’d be a candidate late last year, while Russian officials have said he won’t be allowed to run because of his criminal record. The case was retried after the European Court of Human Rights ruled that the first trial was unfair. 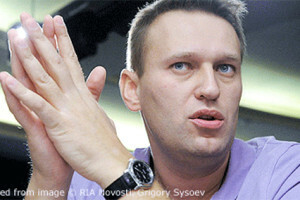 Navalny’s lawyer said that he would appeal the latest ruling to the ECHR as well, the Interfax news service reported. Navalny said on his website on Tuesday that he’d lost 80 percent of vision in his eye as a result of the chemical burns, but that doctors hoped he’d recover with treatment. “If it’s not successful (alas, that’s a possibility), then Russia will have a president with a stylish white eye,” he wrote.